How Much Schooling Do You Need to Best Understand a Papal Homily? There is an article over at Politico regarding the "grade level" quality of communication for last night's State of the Union speech. The author seems to think that the 8th grade comprehension level which is noted as, "the third lowest score of any State of the Union address since 1934," is of some concern. As someone who has used the Flesch-Kincaid Grade Level formula in the past I don't think there is too much to worry about. For one, the formula is a bit flawed (designed to make sure a textbook fits the grade using it) and gives the highest scores to long, complex text using large words. Someone speaking in a stream of conscious manner will score highly but also may be entirely incoherent. Clear and concise speech gets lower "grades" but this speech is often more favorable in terms of communication. Politico seems to think that "Obama's use of simple language is in part a reflection of his audience. ... And it's part of a larger trend in simpler State of the Union language as the speech as transitioned from a simple address to Congress into a prime-time televised event." It is very much more the later—the effects of the medium. The American audience is significantly more educated now than it has been at any time in history. 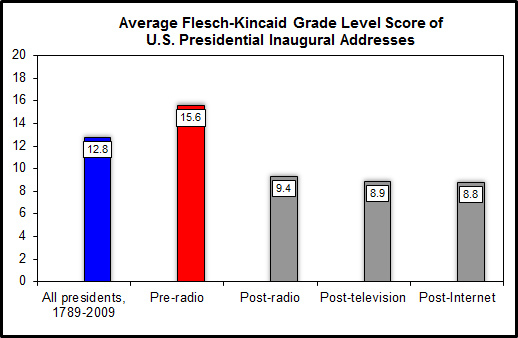 The figure below shows the average grade level for presidential Inaugural Addresses since 1789. The highest score ever was for Washington's first at 25.0 (that's like two Ph.D.s!). Since 1973, these speeches have averaged 8.9. As these evolved from something that most people read in their newspaper to something that was broadcast (first on radio and then on television), the communication has simplified. Eisenhower, Lyndon Johnson, Nixon, and George H. W. Bush all gave Inaugural Addresses with lower scores than Obama's 2009 speech. 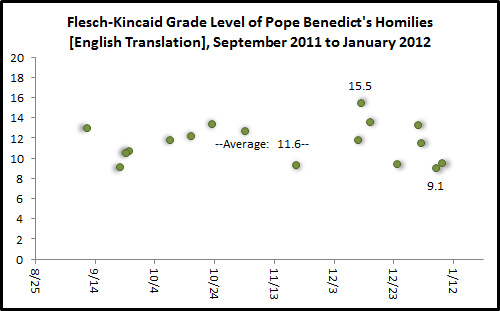 The Holy Father's homilies (translated in English) have been averaging 11.6 in recent months with a high score of 15.5 and a low of 9.1. Now it is the case that these homilies are very often read by more people than they are heard in person. Translation issues may also affect the scores. It is also the case that one might expect the content of his homilies to be a bit more complex than a modern president's State of the Union or Inaugural Address. For comparison I went back and ran the numbers on eight homilies given by Pope John Paul II during his October 1979 apostolic visit to the United States. The average grade level for these is 10.7 with a low of 8.1 and a high of 13.1. It appears one needs about an 11th grade education, on average, to best understand a papal homily and about an 8th grade education to do the same with an American president's speech. We have no Mass attendance polling or headcount data. Yet, it is clear by some measure that the national Catholics Come Home (CCH) television advertisements had an impact in December. Evidence of the number of Catholics seeing the CCH videos, connecting with the CCH website and then some following through with seeking out parishes and Masses jumped up last month. At the time of this post, Quantcast indicated that the CCH website ranked in the top 15,000 sites for traffic in the U.S. The tracking firm estimates that individual visitors from the U.S. in December were up 2,506% from November to a total of 179,239 (by comparison there were only an estimated 1,800 visitors to the CCH site in August 2011). Alexa estimates that 85% of CCH website visitors are from the U.S. and that more than 1,200 other websites link to CCH. The quarterly “daily reach” (the percentage of web users visiting) has been up 430% (Nov.-Jan.) and page views have been up 570% during the same period (about 3 page views per user for more than 3:30 minutes). Alexa also indicates that only 13% of CCH site visitors come from a search engine. Yet, even here—specifically on Google—there was an uptick in Advent. 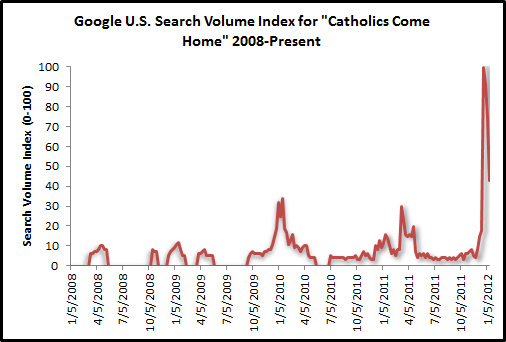 More people searched for “Catholics Come Home” during the last few weeks than at any other time in the past. Google Trends indicates that CCH’s long-term top markets for search volume are in Louisiana, Massachusetts, Florida, Georgia, Illinois, Pennsylvania, Texas, California, New York. The latter three states are the largest and would be expected to be among the leaders. The preceding states include dioceses that have all had specific CCH campaigns in previous Lent and Advent seasons. The Google Trends data also indicate a potential need for new spots. In many of the states with dioceses that have done a CCH campaign there was not as much of a jump in Google search activity during Advent 2012. Did CCH bring people back to parishes? One indicator of interest from Alexa is that nearly one in five who visited the CCH website (18.3%) went looking for a Mass time by immediately visiting masstimes.org. Seven percent of CCH visitors go to divorcedcatholic.com for their next site. Also, since writing a previous blog on this topic, the CCH YouTube channel has increased its subscribers by 10% and its video views by 16%. Did more people read the Gospel of John this month? Want to know how to get people to read the Bible? Apparently it's all in Tim Tebow's passing yards. Two weeks ago when Tebow passed for 316 yards to beat the Pittsburgh Steelers this total did not go unnoticed as his game winning touchdown pass to Demaryius Thomas generated 9,420 tweets per second (#2 all-time in activity). Tebow, already famous for wearing John 3:16 in his eye black in college, unwittingly caused quite a new media frenzy directed right at the Bible. It is likely that more Americans sought out John 3:16 online or in their Bible at home in the 24 hours after that touchdown pass than on any other single day in U.S. history. 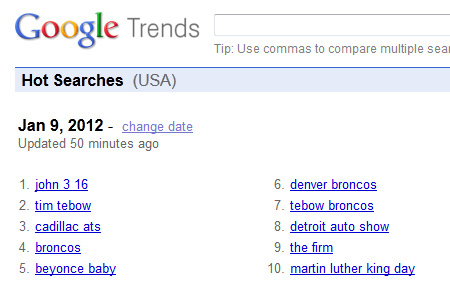 It was the top search term on Google for most of the day after the game (see above). The only other day similar? The other spike on the graph is when Tebow wore John 3:16 in his eye black during the BCS National Championship Game in 2009. 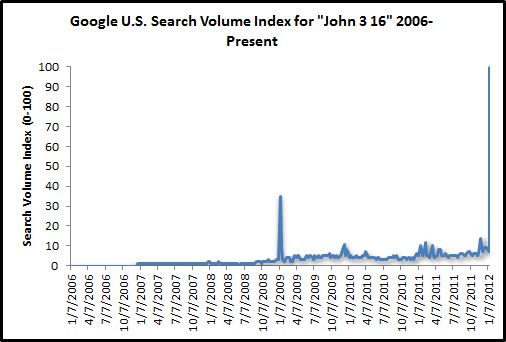 For some context, the chart below shows the relative search volume indexes for "John 3 16" and "Catholics Come Home." 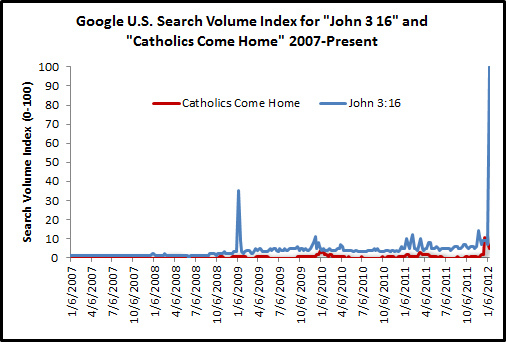 In the first few weeks of January, for every 100 people searching "John 3 16" there were 5 people searching for "Catholics Come Home." Both of the notes above point to a continuing reality. TV is still king of the media world and can drive people to new media and their faith in ways that are not always easily imagined. The bigger challenge for the Church is to try to get the Catholics who may have come back to a Mass in December to continue to do so this weekend or those who may have looked up John 3:16 a few weeks ago to read the Bible today. With Catholic Schools Week just around the corner we've had some inquiries here at CARA about studies that show the effects of Catholic schooling on enrolled children. Most who inquire are interested in evidence of the religious or spiritual impact (the academic results are often publicly available in test scores, etc.). Published research on these effects are a mixed bag. Here at CARA we have shown that schooling can be a buffer against disaffiliation. How might this be the case? Part of it may be in the extra emphasis Catholic children get on the Sacraments while in a Catholic school. 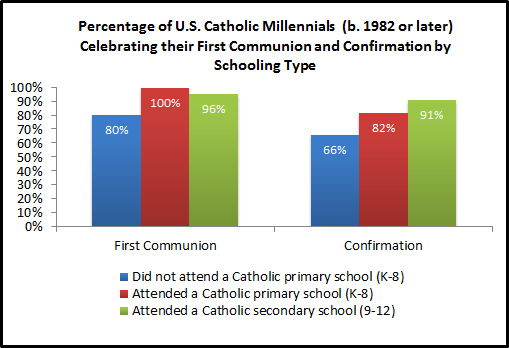 In CARA's Sacraments Today survey we found that among Millennials (those born 1982 or later), nearly all Catholic students at Catholic elementary schools celebrate their First Communions and more than nine in ten who attend a Catholic high school are confirmed. Only eight in ten Catholic Millenials who do not attend a Catholic elementary school celebrate their First Communion and only two-thirds of those not attending are confirmed. In December, a final miracle needed for canonization of Blessed Kateri Tekakwitha was approved. Then and in the past CARA has been contacted for estimates for the size of the Native American Catholic population today. This is a difficult question to answer. One issue is that the population is of a size that makes it difficult to study using national surveys. The second is the complex construction of Native American identity which can range from formal tribal membership to distant ancestral affiliation. If one utilizes the General Social Survey (GSS) from the last decade and the U.S. Census estimates can be made. The GSS asks, What is your race? Indicate one or more races that you consider yourself to be. This question identifies a total of 155 Native American/Alaska Native respondents on first reference (1% of the U.S. adult population) in the sample from 2000 to 2010 (±0.8 percentage point margin of sampling error). A total of 25 or 16.1% of these respondents self-identify their religion as Catholic. Extrapolating to 2012 that would mean there are more than 500,000 Catholics who self-identify as Native American on first reference (or about 0.6% of the U.S. Catholic population). If one includes secondary and third self-identified references (the broadest definition possible with the GSS), the total Native American/Alaska Native respondents for the period is 653 (an additional 472 on second reference and 27 on third reference; this total represents 4% of the U.S. adult population). A total of 79 or 12.1% of these respondents self-identify their religion as Catholic. Extrapolating to 2012 with this broader definition there are an estimated 1.6 million Catholics who self-identify as Native American in some way representing 1.8% of the U.S. Catholic population. The Pew Forum on Religion & Public Life recently released country by country population estimates by different Christian faith groups. Among these is an estimate for the size of the Catholic population in each country around the world. These estimates are based on country-level census data and surveys. The Vatican releases Catholic population estimates annually in the Annuarium Statisticum Ecclesiae (ASE). There are a few years difference between the Pew estimates and the most recent ASE but all the same one would expect the figures to be very similar. So where does the Vatican apparently underestimate the number of Catholics? According to Pew at the top of the list are the United States and Germany. Pew estimates that there are 27.9 million Catholics in Germany compared to only 25.1 million estimated in the 2009 ASE. One frequently sees in the media that the Catholic population of the U.S. is likely about 65 million. Pew puts the current number of U.S. Catholics well above this at 74.5 million (the ASE estimates 69.9 million; CARA has noted for years that the ASE and The Official Catholic Directory underestimate the U.S. Catholic population). One other area of the world that likely needs to come to terms with a more realistic number of its Catholics is the United Kingdom and Ireland. Comparisons are complicated here by the fact that the Vatican's ASE provides a combined Catholic population total for Ireland and Northern Ireland. However, if one takes the total number of Catholics reported by Pew in the UK and Ireland this totals 14 million. The ASE estimates that there are only 10.5 million Catholics in the UK and Ireland combined. The biggest surprise may be Pew's estimate for the number of Catholics in the UK alone which is at 10 million. There apparently are other areas of the world where the Church overestimates the number of Catholics. Brazil is an extreme outlier where the ASE estimates that there are 163.9 million Catholics. The Pew study revises this down to 133.7 million. Other countries likely overestimating their numbers of Catholics include France, India, Spain, Italy, and Argentina. Each is more than 6 million off the Pew estimate. For example, the ASE estimate for the number of Catholics in India is 18.6 million. Pew finds evidence for only 10.6 million.